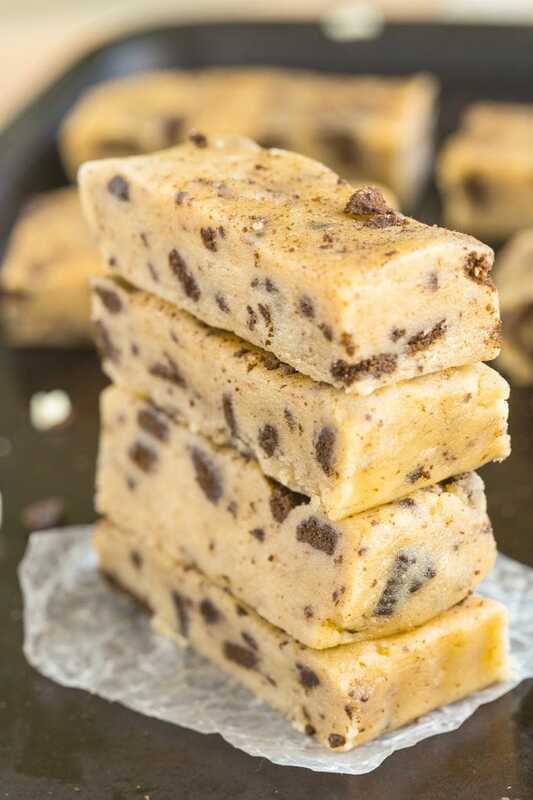 Just ten minutes is needed to make these delicious no bake protein bars which taste like a cookies and cream dessert bar, but so much healthier! These bars are refined sugar free, gluten free, vegan, dairy free and have a tested paleo option too! Much better than store bought and easy to make! Oh yes. The good old budget of the college student. I learned many things during my college semester abroad in New York. I learned business statistics and applying them to various organizations. I learned how the left side of the brain does something different to the right side of the brain. I learned that Saturdays were the best days to eat in the Dining Hall. I learned that Sundays were the days leftovers got fancy makeovers in the Dining Hall. I also learned that a typical college students’ budget only goes so far. During the first few weeks of college, I learnt pretty quickly just how limited my budget as a student was. Not being able to work whilst on my student visa at the time, I had to allocate specific portions of my savings to be able to maintain my time over there comfortably. I’d spent the three years leading up to my exchange working and saving every cent to ensure I could cover my flights, tuition and everyday living expenses for the entire 6 months. Call it self pride or stupidity, but I’d never been one to ask mum for money when things got tough or my bank balance got low. If I couldn’t afford it, I didn’t get it. Simple as that. Let’s not talk about Niki who does NOT share those same sentiments. When it comes to budgeting and only having a limited budget, spending money on snacks outside of what’s included in the meal plan wouldn’t be particularly high on anyone’s list. Speaking from experience, why would I buy a healthy snack bar when I could buy GOLDFISH CRACKERS WHICH CAME IN 10 COLORS?! Sorry, I may also be biased because I’m Australian. But seriously, multicolored goldfish? Let’s not talk about the flavored vitamin waters…..
Amongst health and fitness enthusiasts, you’d have to be living under a rock not to know what a Quest bar is. They are those high protein, low sugar snack bars which are tasty and pack a nutritional punch. Although I do enjoy them as a quick and healthy snack when I’m out and about, I’m most certainly not going to make a ball gown of them or call them a dessert. As an active college student or someone who wants a healthy snack bar to have on hand between meals, they would be a great option. 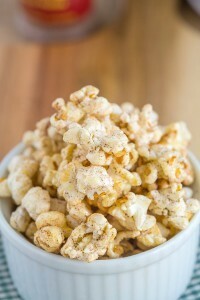 As part of my partnership with Kohl’s, I’m sharing quick, easy and healthy snacks which can easily be made in a dorm room or at home with kids. I wanted to recreate one of my favourite Quest Bar flavours, cookies and cream, but without the hard to find ingredients and that artificial fiber. 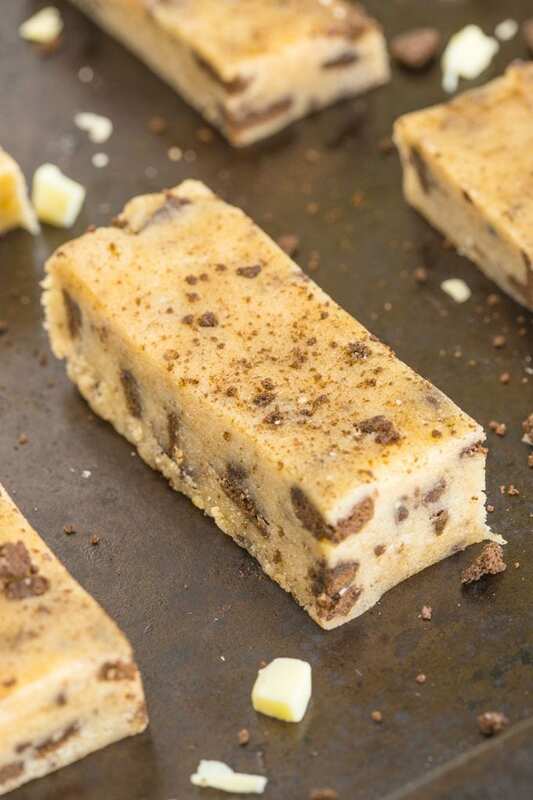 These healthy No Bake Cookies and Cream Protein Bars literally taste like dessert but are chock full of the good stuff to keep you satisfied. 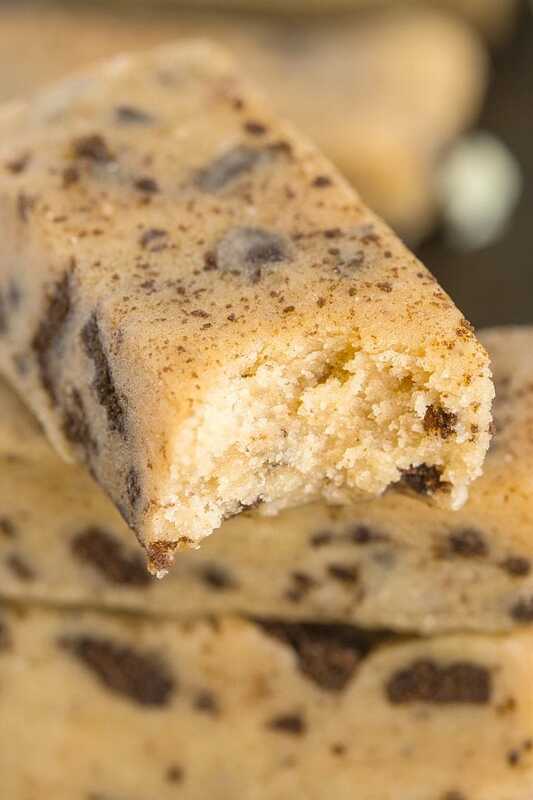 Not only do they taste like a cookies and cream dessert bar, but they have a soft and chewy texture NOT aided by any artificial fiber substitutes. Naturally gluten free, they are also vegan, high in protein and they also come with a tested Paleo version too. Not only do they take less then 10 minutes to whip up, they don’t need any fancy kitchen gadgets AND they don’t need refrigeration. Delicious hack- Although many of my no bake recipes can be stored at room temperature (trust me, I always try it out!) if you keep them frozen and thaw out for 10 or so minutes, they actually taste like fudge- Perfect if you have one of those mini fridges in your room. Healthy protein bars which taste like fudge that can be eaten anytime? I think so. 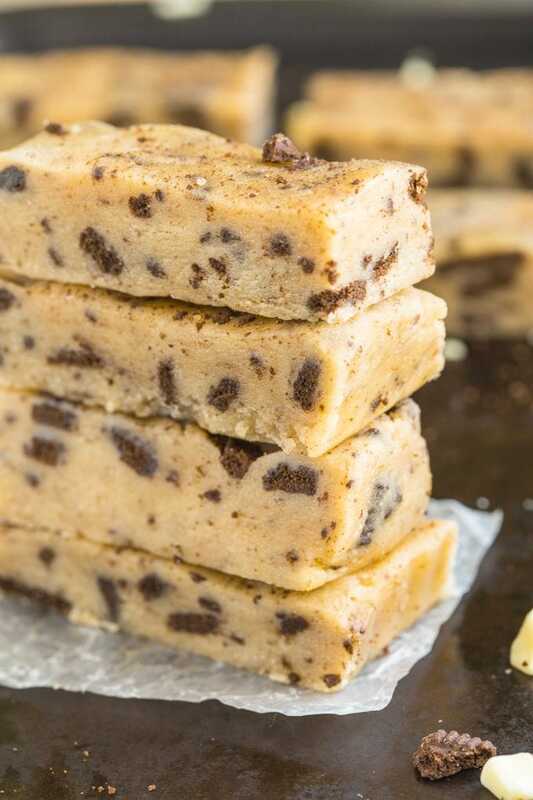 Make these healthy no bake cookies and cream protein bars and spend the money saved on store bought protein bars on….textbooks. Line a large baking dish with greased paper and set aside. In large microwave safe bowl, combine the flour, protein powder, granulated sweetener and chocolate cookie crumbles and mix well. In a microwave safe bowl, combine the nut butter and liquid sweetener and heat until melted. Pour the wet mixture into the dry and mix well- It should be crumbly. Using a spoon, add the dairy free milk of choice one spoonful at a time until a thick, firm batter is formed. ** Depending on the flour/protein powder combination, you may need more or less. I used up to 3/4 cup with the paleo version. Have you checked out my other recipes as part of my collaboration with Kohl’s? Cheers, hugs and handshakes for supporting companies and brands which help in making The Big Man’s World continue to grow. College students/post college students- Where did most of your money go? What is your ideal grab and go snack? Oh hi, you had me at Cookies and Cream – one of my favourite ice cream flavours at the scoop store in my hometown. And that in a bar? Yes, please. Coming from me as a non-bar fiend. I’ve never experienced that student-abroad/US student on a meal plan feeling but from hearing about it elsewhere already it seems tough business. I’m pretty sure you’ll make some college students happy they can prepare their own bars and save money for textbooks 😉 . These are so good- Promise they are delicious! I’ll be trying these since the fiber in those quest bars scares me! They look so good! I just tried the cookies & cream quest bar for the first time and it was the first flavor I’ve actually enjoyed! That said, even though my budget is bigger than it was in college, those bars add up fast! It’s definitely cheaper making my own! I’ll have to give this a try! Thanks Liz- Hope you enjoy them! I think I spent more money on clothes than rent or food during uni. Those were the days haha but I agree with you – I’m completely stubborn and refuse to ever ask my mum for financial help. Haha, clothing is always a big one too! I wish I had this recipe in college when living on a student budget in Oxford and trying to cook with only a semi functioning oven! These look amazing, will be trying now I’m home in the heat again! Honestly in college I was not good at budgeting, now I’ve become better after law school. These are so good! You should make them when you start working! You know what is totally insane!? I have NEVER had a quest bar. I KNOW! I tried to order a free sample online…and then they never showed UP. SO SAD. But whatever, I’ll make yours instead. Over it! Pinned! Can you believe I’ve never had a quest bar? I see them everywhere, but never bought them. Your version looks really good though! Cookies and cream anything always sounds so good. Considering I just made homemade granola bars for the first time ever this past weekend, I figure I’m a pro now at the homemade snacks haha. Thanks heaps, Kelly! You need to try this out- SO GOOD! I just started the school year again and I understand the college budget! I have a kitchen in my dorm room this year so I’m luckier, but you have to learn how to make your dining hall meal plan stretch! Thankfully my university has amazing options for a college (I’m talking salmon and quinoa some days). The text book prices do not help the budget though! These look so easy to make though. Could you switch out the cookies for freeze dried fruit or other add in to change the flavor? I’ve never had a Quest bar buuuuut yours look way better. Also, we are the same–if I ever asked my mom for money she would 100% think I was joking. In fact I actually have no idea what she would say because I’m certain she would be so confused. I can’t remember where my money went! That tells you how much I paid attention, haha. Confession: Even though dairy hurts my stomach, I love quest bars. Thank you for making a dairy free option!!! Oh man, I remember those days when I had to literally count every penny. I’d go digging around under the cushions of the couch in my dorm room for extra change. (I never found any…) I do remember “splurging” to go get cheese quesadillas at a little hole-in-the-wall Mexican place every Friday night. I’d get takeout and then chill out in my dormroom playing video games and watching sports until it was time to go out…or go to bed. Ah, those were the days…now I go to bed at 9pm. Haha! But these bars? Love them! Cookies and cream is one of my all-time favorites!! Haha college budgets….otherwise known as mac and cheese and ramen noodle diets. I love quest bars, these protein bars look awesome. And cookies and cream is the perfect flavor! Thanks so much, Aimee- Oh ramen noodles…damn those things haha! My savior! I might be in love with you right now over these. I still think back to when i took down my first no bake black bean fudge in my NYC hotel room and inspected where the keebler elves were coming from on HOW it could be so good. Right? Thanks so much, Meredith! 🙂 I wish you were here now…to help me pack. Ahhh the college budget. I’m impressed with you saving up and not phoning your parents when times got a little tougher. I think I’m more on the same boat as your sis ;). But anywhooo, these look amazing! King of the No-Bake ANYTHING. Not in college yet, but my money usually goes into food and other knacks I find at the mall or online! Thanks for the natural, high quality protein bar recipe! I have a feeling this is going to be one of my new favorite treats! These look like healthy quest bars to me!! Cookies n Cream anything is a win in my book.. and when you take out any nasty ingredients – I’m all for it! I love this cookie and cream bars, and you used my favorite flour! 🙂 And, I have to admit I love the chocolate chip cookie dough Quest bars — they are always in my pantry. Well since I will eventually run out of quest bars, this could be a good option, although I own none of those ingredients. Not yet! YES! Do it, Tonya- I wish there was a way to send stuff, I’d send you all my no bakes seriously! My college student is pretty pathetic in the cooking dept although I imagine he will learn at some point. Right now all he ever cooks is kale. I know, that’s a bizarre one, isn’t it? Anyway, I might just have to make these and send a care package! If I was your son, I would be bribing you to fedex some home goodies on a consistent basis! But KALE? Wow. That’s impressive! My money went to books. Not textbooks, books for pleasure I bought off Amazon because there was no fiction section in the library. I was still reading, so I told myself I could slack off on other studies. Oh nice! I love reading! I’m not going to lie, most of my budget went on alcohol… Then food! But the legal age in the UK is 18 so at least it was all above board! Haha! Favourite grab and go snack is dates – although I have found these date rolls here that are either coated in coconut, almonds or pistachios! So addicted! Someone made a ball gown out of Quest Bars? I think I might hurl. I like your sketch free version. Speaking of sketchy, in college, I lived on Kraft Macaroni and Cheese and cheap beer. Just wait until you’re using that blender to guzzle fruit smoothies. Mark my words, it’ll happen. I love the look of the frittata with cheese. Mmm. I made zucchini roll ups once. They were inedible. Maybe I should have busted out the blender instead. I literally have no words. These look amazing. Do you ship to Canada? Better yet… do you deliver in person? Yeah, college, I remember those days! Love cookies and cream and will definitely try these ! Pinned! Wait, do you have the recipe for the homemade paleo nutella cookies? Because these sound like the bomb, and I would love to try them! Pingback: . link love 8/30 . - . running with spoons . These look delicious. Would anyone know the macros of these? Mainly protein, carbs and fat. ( and anything else ). I can’t have any sugar in my diet. Can I leave out the maple syrup? Wondering if they would be too dry, could I just add more milk? Hi Ali! You sure can- Definitely add more milk, you may need to add some extra granulated sweetener. How many servings/bars is this supposed to make? What size pan-8×8 or larger? I’m trying to input all this for nutrition value to actually compare to the Quest bars, which I eat regularly. I just took them out of the fridge and they are a little tacky (putting one in the freezer to see how that works). I used ¾ cup almond butter, 2T maple syrup, and had to use almost ¼ cup skim milk to get the thick batter. It was super hard to get it to come together. I put it into Myfitness Pal for 12 bars (8×8 pan): 225 calories, 10.4 g fat, 2.8 g fibre, 21 g carbs, and 12 G protein. Overall more calories but less protein than a Quest bar. Tasty though! I was wondering what the nutritional information is on these bars? Hi Carly! If you add the ingredients to a calorie calculator, it will provide it for you 🙂 Enjoy! For sure- If you go to http://www.myfitnesspal.com you can calculate it 🙂 Enjoy! So I am not sure what I did wrong, I made the bars but they turned out to be a cookie dough consistency rather than a bar… What makes yours look/taste like an actual bar??? Hi Kathie! It might be dependent on the brand of coconut flour and/or protein powder you used- I’d continue adding coconut flour to make them formable into bars. Hello! I wanna try your recipe, but do you mind telling me how much portion is 2 T? Or 1 T? Please. Thank you! Hello! I hope I’ll still get a response even though this was posted a year and a half ago! 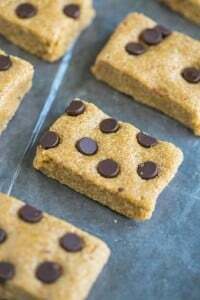 🙂 I do not follow a strict Paleo or Vegan diet but these look so incredible and I want a recipe to make my own protein bars. One question, will Whey protein work in this recipe? Would Vanilla Rice protein work? Or vanilla Soy protein? Also, about how many bars does this make?